Ylang ylang is scientifically known as Cananga odorata, it is native to Philippines, Malaysia and Indonesia as ylang ylang are usually found in rainforest of Asian and South Pacific Islands. Ylang ylang is a tropical tree, belongs to Annonceae. It grows well in full or partial sun and acidic soils up to 12m in temperate , having smooth and oval leaves and 13-20cm long and its flowers is drooping, long stalked with green yellowish petals and sea star in shape. 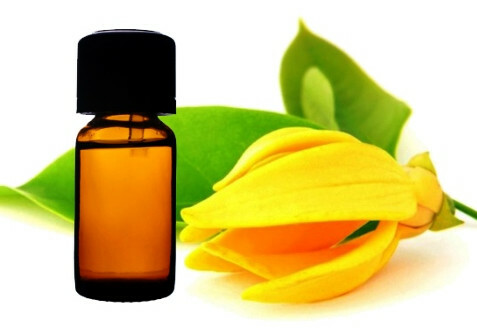 Ylang ylang oil is acquired from fresh flowers of ylang ylang tree through steam distillation method. The main components of ylang ylang tree are benzyl acetate, benzyl benzoate linalool, caryophyllene, geranyl acetate, p-cresyl methyl ether, pinene, eugenol, farnesol and farnasene. Ylang ylang have sweet, clear and yellow in colour, its aroma is strong, fresh and slightly fruity. Ylang ylang oil is nicely blends with bergamot, grapefruits, lavender and sandalwood. Ylang ylang oil is the key ingredient in legendary perfume. It provides relax to body and soul. It is effective against insomnia, fatigue and frigidity. It regulates production of sebum which protects hair and skin from drying. It has many skin care uses are as they maintain skin moisture, treats eczema, clears and heals acne. It promotes hair growth and acing as natural conditioning agent. As it has anti bacterial property, it is effective against skin irritation and redness. It helps in nervous breakdowns, acute depression, anxiety, sadness and chronic stress. It heals wounds and infections due to its anti septic property. It promotes healthy blood pressure levels. It is used for treatment of stomach infections, intestine, colon and urinary tract infections. It reduces tension and provides calmness and relaxing effects. Avoid ylang ylang oil contact with eyes. Do not use ylang ylang oil while pregnant or nursing women. Keep away from reach of children under the age of six years. Do not take in excessive amounts as it can cause sensitivity, nausea and headache. Appearance : Colourless to pale yellow clear liquid. Odour : Fresh, floral, sweet, slightly fruity, delicate fragrance. Solubility : Insoluble in water, soluble in ethanol & organic solvents.